On Friday, February 12, the Clarenville Caribous presented their player awards prior to game 3 of their semi-final action against the Corner Brook Royals. 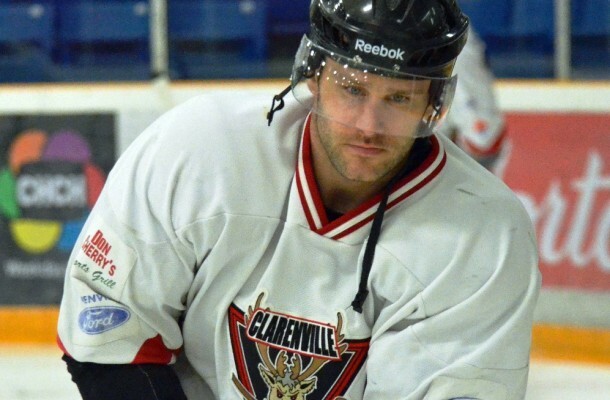 Defenseman Brandon Roach was named the Central West Newfoundland Senior Hockey League (CSWHL) most gentlemanly player, collecting only four penalty minutes in 22 games played. He also managed to contribute 18 points (5G / 13A) during the 2015-16 season. Ryan Desrosiers collected the team’s most valuable player award, amazzing 31 points during the regular season with 19 goals and 12 assists. This is the second year in a row that Desrosiers has picked up the MVP award for the Caribous. On Sunday, February 14, teh Caribous presented the Jack Duffitt Memorial Award to the volunteer and player with the Caribous who demonstrated dedication, devotion and outstanding performance in hockey. This was given in memory of one of the Caribous longtime fans, Jack Duffit. This year, the recepients were General Manager and assistant coach Ivan Hapgood for his volunteer work with the organization. Cody McNamara was given the player award. The Duffitt family were at the games and presented both awards.